For people like the Tonga, planting the seeds and harvesting signifies being in harmony with nature and the gods who regulate the process with sufficient rains at the right time and measured amounts of sunshine that helps the plants prosper, in a cycle of life that repeats itself from year to year. Failing rains show that the harmony between men and the gods has been disturbed, and people are often able to appease the gods and restore the harmony of nature. But now that nature seems to be off-balance all the time people are bewildered, and Adult Education has to find new roads to help them understand the changed conditions and cope with them. Timote Masima Vaioleti, chairman of the Indigenous Maori and Pacific Education Charitable Trust (IMPAECT) in New Zealand, describes the challenge. Towards the end of 2010 and at the commencement of 2011, I conducted talanoa1 with several people in the kingdom of tonga on the impact of the changing environment on certain parts of their life. 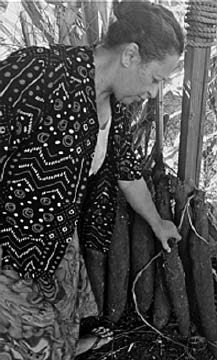 this article brings together those talanoa and talks about the ‘ufi (yams) in particular, a food plant that carries immense significance for the emotional, spiritual and economic wellbeing of tongan people. Its stories of planting, growth and harvesting are steeped in the historical, mythological and spirituality of being tongan. The annual life-cycle of the ‘ufi includes the nurturing of the bed preparation, planting, maintenance, harvesting, storage and producing seedlings. every stage of the whole cycle commands close attention, dedication, patience, gentleness, great intuition or oneness with nature and skill. this is because each stage of the plant’s growth is congruent with the seasons relying on the seasonal environmental conditions including rainfall, sunshine strength as well as humidity both day and night. I will share a story about the possible negative effect of micro changes as a result of the current changing climate in the growth of ‘ufi and the possible psychological, economic as well as spiritual impact these will have on tongan people. Tonga is an archipelago in the South Pacific ocean. It comprises of 176 mainly low lying islands scattered over 700,000 square kilometres of ocean and is part of the Pacific so called ring of fire. For this reason it is highly sensitive to changes in weather, tsunami, hurricanes and volcanos. tonga, which is amongst the oldest communities of Polynesia, was never formally colonised. It is recognised for its past political and spiritual influence in the region, stretches over a distance of about 800 kilometres in a north-south line located at about a third of the distance from new Zealand to Hawaii. By and large, tonga has a culture of subsistence living, highly dependent on the abundance of nature. Food is gathered daily from the sea and lush land, and the strong family unit supplies other basic needs. the material items and frivolities, on which most westerners spend their disposable income, just do not exist. 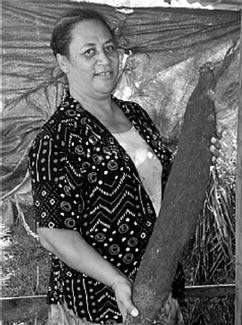 the tongan currency is called the pa’anga, but large, hand-made tapestries called ngatu (tapa) and ‘ufi (which can both be the domain of women) are still used as a form of currency and wealth. The kingdom of tonga is in the most eastern time zone – the first to see the sunrise, and at the end of the day, then they are the first to see the sunset. this fact along with the changing climate is of small significance to the local people. However, they are astute to the differences and change in their lush land, food production and fishing conditions. tonga, along with other small Pacific states, are the first to notice the effect of the rising sea and changing conditions to their environment and lifestyle. As the indigenous people of these islands, the tongan people spiritually base their faith on the old religious ways of the past. Most of the present population profess to be christians. However, if one cares to analyse the underpinning of their cultural activities, one will not have to search far to discover that their belief is based in serving and pleasing ancestors, the spiritual world and the god/s of the past. According to their traditional stories, the spirits of ancestral chiefs go to the underworld place of Pulotu once they die. From there, they watch out for the living, and some even become patrons of certain occupational classes, families or individuals. the supernatural then still occupies the thinking and intervenes in tongan peoples’ lives today. the most important day-to-day necessities for cultural relationships are from the underworld. Fire that was a prized commodity in the distant past was a gift brought from Pulotu. Like other Pacific nations, a flower garland has a special cultural place in the tongan culture. the colour of the garland, the composition of the flowers, their arrangement and how they are woven require specialist skills. At principal positions around the garland, flowers are arranged in clusters to enhance high rank, and chiefly flowers are placed at the centre of each cluster. Among the highest ranked flowers is heilala. Heilala was brought from the underworld (world of spirits), similar to the ‘ufi which is a special chiefly food plant and is from the spirit world as well. It is an integral part of the cultural exchanges, economic as well as being used for seeking spiritual favours for day-to-day necessity amongst the people of tonga. Keeps the seedling aerated and warmed from the right amount of sun. when the shoot of a new ‘ufi breaks though the top of the mound as it grows, it twists its way out like a single solid whisp of smoke towards the sky as if it’s a spirit rising from the tomb. the leaves grow out of the twisting stem over a few days, and as their weight becomes too burdensome for the stem it falls to the side of the mount, then creeps down and out of its mound to meet and weave with other ufi in the plantation. The most desirable part is the root. As the ‘ufi grows the root turns into a single long tubular form tuber, growing downwards under the mound and well into the ground through a pre-dug hole which has been loosely refilled with good healthy soil. the ‘ufi tuber is prized as food, used for cultural exchanges, gifted to high-ranking people or given as a tribute to the god/s. the most majestic long and slender variety, kahokaho, grows to nearly two meters. kahokaho are amongst, if not the highest ranked, ‘ufi. kahokaho is very difficult to grow and often referred to as ‘ufi fie’eiki (characteristics associated with chiefs which are intolerant, impatient, confrontational, unpredictable and based on pride). the way they are planted, maintained and harvested are labour and attention intensive. the seedling for the ‘ufi itself is grown from the ‘ufi body (tuber), the part that is consumed. For seeding, the ‘ufi tuber of the best quality is cut along its length into 15 – 20 centimetre cylindrical portions. these are further split in the middle along its length giving two seedlings. In a well-prepared earth bowl one to two meters in diameter, the seedlings are stacked strategically to allow air to circulate around the space between them. the seedlings are separated to allow the new shoots to grow into the spaces between the seedlings before covering them with leaves and loose dirt forming a dome. they are then left for around two or three weeks depending on the weather. the shoots then should break through the seeding mount, and this is an indication that they are ready for planting. this again depends on the time and the effect of the season. the timing is vital. ‘Ana Veilangilala Huni, an acknowledged expert and planter of ‘ufi, says these are done around July and August but no later than September. There are two vital reasons for this. the moisture content of the ‘ufi tuber which is normally harvested around late January to March is at the right level (low). the ‘ufi is stored in the shade with plenty of light and air. these apparently give the ‘ufi enough time to lose its moisture content as well as to build resistance to rot. this is an important resistance that is desired when the seedlings are underground inside the earth bowl for two weeks. the other reason is that the local conditions in July and August have the right temperature and moisture content to facilitate strong growth from the seedlings. The preparation of the beds for the ‘ufi requires one to dig a 30 cm square hole to an ideal depth of 1.5 to 2 metres in rich soil (preferably virgin ground). these holes are dug out by hand only. these tasks can take up to 30 – 45 minutes each. when planting the ‘ufi, the hole that has just been dug is filled with loose soil to the top. the seedlings that now have shoots of young stems and leaves growing out of the pulopula are placed on top of the filled hole with the dominant growth aligned with the filled hole. A year that produces the above kahokaho and more will be regarded as a good year and an indication that those that control nature and the environment have been pleased with the good deeds of the populace. the best, the most perfect and often biggest ‘ufi are taken to the representative of the god/s in the community such as the highest ranked female of an extended family, chief or noble, but in most cases now, to the church ministers as tributes and a type of request for continuing good harvests and spiritual blessing. My father told me when he was alive that a certain prayer is said while planting each ‘ufi. In fact when planting other food plants there are special prayers that go with it. If these things are done properly then the harvest of good ‘ufi will mean that the god/s have been pleased with the services of the people to the god/s or those that represent them in this world. these assurances are vital to the spiritual, emotional, cultural and economic wealth of tongan people. When the ‘ufi harvest is poor despite performing all tasks according to the right time of the year and good environmental conditions, then it is seen that the supernatural or even god/s have not been pleased with people’s earthly deeds. Such a state of mind could last a year or until the ‘ufi harvest and offering to the god/s are of appropriate size and quality. For this state, then the local people blame themselves. these mental and spiritual burdens can bring about a sense of guilt and abandonment by their god/s and possibly their own ancestors. For a holistic and collectivist population, these are heavy and difficult emotional and spiritual preoccupations as the shortage of food is an increased burden carried on top of the shame of the local people. Kahokaho attracts the best and highest price if they are sold. to a tongan, their taste and food quality is beyond compare. In pre-contact time ‘ufi was at the centre of ‘Inasi, a festival of giving the first fruit to the god, Hikule’o, a female deity, high priest and guardian of the gateway to the underworld. Favours were requested of her, including good harvest of the ‘ufi that originally came from the underworld, and patronage over the past relatives in the spiritual world. ‘Inasi was also a type of fertility festival. Big, long and slender kahokaho are offered to Hikule’o, and if the kahokaho are pleasing to her she will receive them to her fertile body.2 As a result she becomes fruitful producing an abundance of offspring, and the harvest of ‘ufi and other foodstuff for the next year will be plentiful. Crystal clear in my exchanges with ‘Ana is that much of the growing of ‘ufi is determined by certain balances in moisture content, sunlight, rain, soil condition as well as how pleased ancestors and the god/s are with the work of the peoples of the land. As the environment changes occur, then, the harvest of ‘ufi seems to have become poorer and poorer. Sadly, these poor harvests have been occurring frequently in the last few years. Climate change researchers and scientists tend to explain the changes in seasons, sea changes and food growing conditions in a positivistic manner and assume that their messages make sense. these may only be partly sufficient for tongans who are religious in the modern christian form and spiritual in the ancient form. For the scientific and academic community to be effective in working with indigenous people to raise their awareness and cope with the negative effects of a climate changing world, there is a need for them to understand the pervasive spirituality in the cultures of indigenous people, tongans in this case. these understandings must inform their research methodologies, reports, communications and relationships with the local people as well as their relationship and communications with their own sponsors or funders. With the help of Adult education, other explanations can be placed before the local people beyond scientific explanation and in ways that local people understand. communicating different understandings and alternative reasons for changes in the weather and environmental conditions for growing the highly sensitive ‘ufi, give local people an opportunity to think differently and not to continue to blame themselves for upsetting those in the spirit worlds which resulted in a continuing bad harvest of kahokaho. Planned Adult education approaches should produce a good number of learners with the alternative perspectives that the reduction in the quality and quantities of their sensitive ‘ufi are caused by man-made reasons in communities and countries far away from their islands. Education for Sustainable development (eSd) is an approach that may help tongan people to firstly free themselves from the burden of wrongdoing when a changing climate world impacts negatively on their subsistence lives. Secondly, it may assist them in studying the changes in the weather pattern, to adjust the timing of the different stages of seedling, planting, harvesting and storing of the ‘ufi. the third benefit of eSd is that it will equip them with knowledge and strategies that they can use to articulate their perspectives and lobby their local authorities for change. eventually with appropriate (adult) education, local people may mobilise to present their cases to the organisations and countries that can advocate to make a difference to the negative changes in weather patterns globally. this may improve the poor harvest of ufi. Tongans are intimately connected to nature, and most people with whom I have engaged in talanoa have noticed that the weather seems less predictable and the sea level seems to be rising. Many, however, were not familiar with the concept of a climate changing world. that will probably change soon. For just like the sunrise and sunset that tongan people see everyday before anyone else in the world, climate change will continue to arrive first in tonga and other small island states. And unlike the leisurely rhythms by which most business and activity is done in tonga, the global changing climate issue must be tackled with urgency and haste. For tonga itself, there is an opportunity for ASPBAe and its eSd committee to assist in creating education that informs indigenous people of the small nations in the Pacific. this can include education in the reality of a changing climate world and advocacy strategies to cope with the changes and to appeal to those who carry responsibility for the climate change now being witnessed in their seas, their land and the production of their ‘ufi necessary for their holistic wellbeing. 1 A traditional (tonga, Samoan, Fijian, niuean) way of conversation, talking, exchanges guided by contextual protocol and ethics. recently, talanoa has been developed into a Pacific research Methodology (Vaioleti, 2003; 2006). 2 Hikule’o is physically represented by the fonua, which can mean the land, sea, environment, people and all entities within.